I No Longer Need that Lookup, Folks! A little over a week ago a Facebook friend, the descendant of a half-sibling of my 2nd great-grandfather’s half-sister (let that sink in), shared a post I wrote in 2014. Note: As of 13 January 2019, the 2014 post has been updated with sources and images. My 3rd great-grandfather William CLONCH was a challenge to research. Ralph Hayes worked on the CLONCH families years before I did and posted his finding on the CLAUNCH surname mailing list on Rootsweb as well as in other forums popular over 17 years ago. Most of the descendants of William’s father Dennis CLAUNCH use the CLONCH spelling. Dennis had brothers whose descendants go by CLAUNCH. William CLONCH never married my 3rd great-grandmother Mary E. “Polly” DOSS. He left land to her and her children in his will in 1863. In 2011 after FamilySearch added the collection of West Virginia Will Books, 1756-1971, I went in and found his will and transcribed it. It was only then that I actually saw the words he had written, naming her children with the DOSS surname. In my 2014 post, the transcriptions were included for the will and three other records produced at the time the will was ordered to be recorded. In Mason County deed book 53, page 202, dated 29 April 1892, John W. and wife Mary E. Clonch, Alexander and wife Bertha (sic, Tobitha), Charles and wife Mary, Thomas and wife Missouri, Joel and wife Betsy, heirs of William Clonch to Louvenia Patterson all of the Mason County, West Virginia, property in Clendenin District, Mason County, West Virginia. According to these records, William Clonch is the father of the Doss children. Note: I don’t have images of or a true transcript of this record. A look-up would be appreciated. When my Facebook friend shared the link to William’s post, one of her friends made a comment about the missing record. This lead me to take a new look at FamilySearch‘s catalog to see if land records for Mason County, West Virginia, might have been added since the last time I checked. Last year while working on my Rewriting the Biography of James SIMS 1754-1845 series, I found tax records for the area he lived. And it seemed each time I went in to look for something another collection had the camera icon indicating the digital images were available. If the counties of Kanawha, Nicholas, and Fayette where the SIMS families lived were going online then wouldn’t the rest of the West Virginia counties also be updated? I went to the catalog and searched for Mason County, West Virginia, and began looking at the list of records. I opened up Land and Property and found Deed books, 1803-1901. These are browse-only records and include the grantor and grantee indexes as well as the deed books for 1803 to 1901. I went straight for the record I’d requested over four years ago. It was there in Deed Book 53, on pages 202 through 204 – but I won’t be sharing an image or transcription in this post. The deed books have an index at the front and I noticed there was another record for a CLONCH individual, my Alexander CLONCH, the son of the above mentioned William. When I read the record I knew I had to take a closer look at the grantor and grantee indexes. I found, in all, five deeds dealing with the land left to the children of William CLONCH. Transcriptions will be shared in a separate post next week. Folks, pass the word around to check the FamilySearch catalog. They may have collections of interest to you with the camera icon instead of the camera with a key (indicating restrictions) or the microfilm icon. Clonch cousins, sorry for keeping you hanging. If you can’t wait until next week, go to the catalog, and do the searches I did. Happy huntings! Author Cathy Meder-DempseyPosted on January 18, 2019 Categories GenealogyTags camera icon, catalog, Clonch, FamilySearch, land deeds, Lookups, Mason WV17 Comments on I No Longer Need that Lookup, Folks! Almost all of my research for the Luxembourg families in my family tree takes me to FamilySearch. The collections I use the most are for civil records, church records, and census. The Luxembourg Church Records, 1601-1948 are the last new addition (for Luxembourg) to the FamilySearch site having been added on 9 January 2015. I wrote a post when they went online. Included in the collection of church records are the Tables des mariages 1700-1798 (index organisée par l’époux/l’épouse), a card index of marriages performed in parishes in the Grand Duchy of Luxembourg before 1800. The Luxembourg Association of Genealogy and Heraldry (ALGH) was founded in 1984 and has its headquarters in the castle of Mersch. It does not have an internet presence. ALGH launched a huge project when the association was still young. A team of volunteers extracted all marriage information from the 156 old parish registers from before 1800 onto index cards. The project took years to finish. The original aim of the ALGH was to make xerox copies of the index cards by parishes for members to consult in their headquarters making it unnecessary to go to the original. 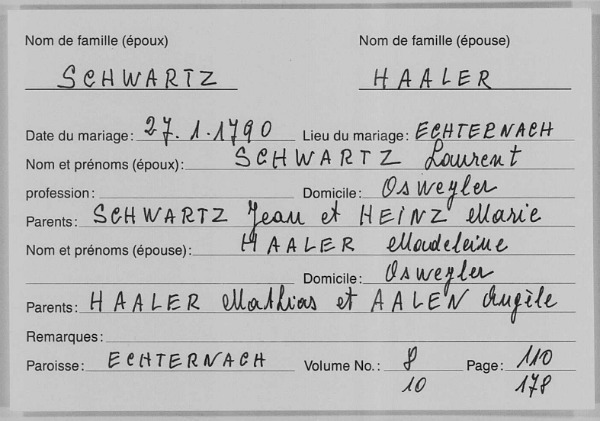 FamilySearch microfilmed the marriage index cards in 1995 and included them in the church records collection for Luxembourg when they were digitized in 2012 and finally went online in 2015. The cards are in alphabetical order by groom’s and by bride’s surnames for each parish. They are also accessible in alphabetical order by groom’s surname for the entire country in Grand Duché du Luxembourg. Why did I have to use a back door? As I’m now working on the paternal 5th great-grandparents of my children in Luxembourg, I’ve gotten into an area which is no longer covered by the civil records kept in the country. Most of these ancestors were born, married, and had children before 1800. These can only be documented by searching through the church records. Records after 1800 are relatively easy to access as civil records are indexed in the tables décennales, decennial tables produced every ten years since 1802. However, church records are not indexed and very hard to read. I check the card index for marriages first as they make it easy to search for marriage records in the church records collection. Most of the time. In the example at the top, for the marriage of the SCHWARTZ-HAALER couple, the volumes and page numbers of the records are notes. Not all persons who filled out these index cards gave this information but the records can still be more easily found as the cards include the date and place of marriage. However not all ancestors married in the town they lived in, so finding the card is not always easy. Some married in neighboring towns or in the town a bride was from. To be sure I didn’t miss anyone, I checked all persons (this works for grooms only) of a surname in the cards for the entire country. And this is where I had a problem. 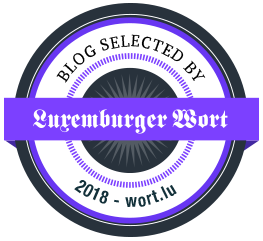 The links for marriages of grooms with surnames from BIVER to HEISDORF are missing. 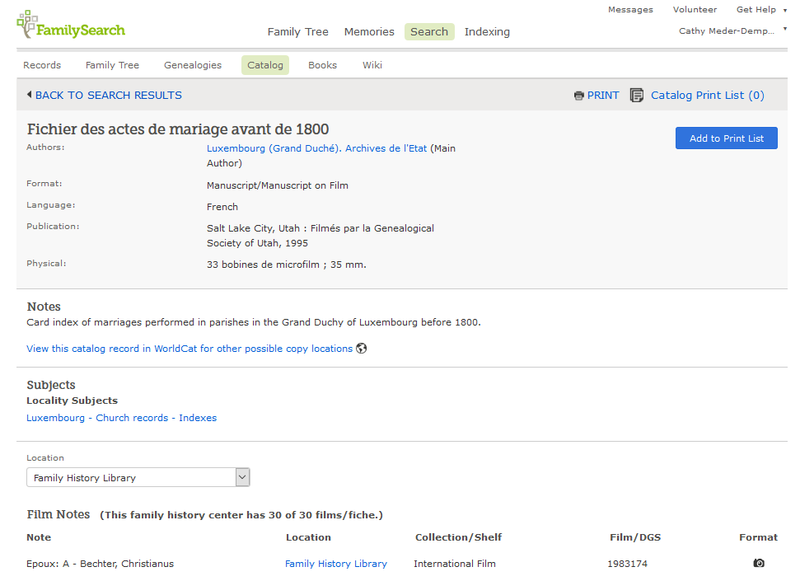 I went to the FamilySearch catalog to find out where they might be found. I refined the search with Luxembourg as the place and church records as the subject. Under Luxembourg Church Records Indexes I found 8 entries including Fichier des actes de mariage avant de 1800 (index cards of marriages before 1800). Scrolling down to the Film Notes I found the collection is divided into 30 films including the missing ones (outlined in red). The camera icon is my back door to access the cards for grooms with the surnames BIVER through HEISDORF. This back door at FamilySearch can be used for any and all of their collections. When you go in through the front door, the name of a collection may not reflect the complete content of a collection. 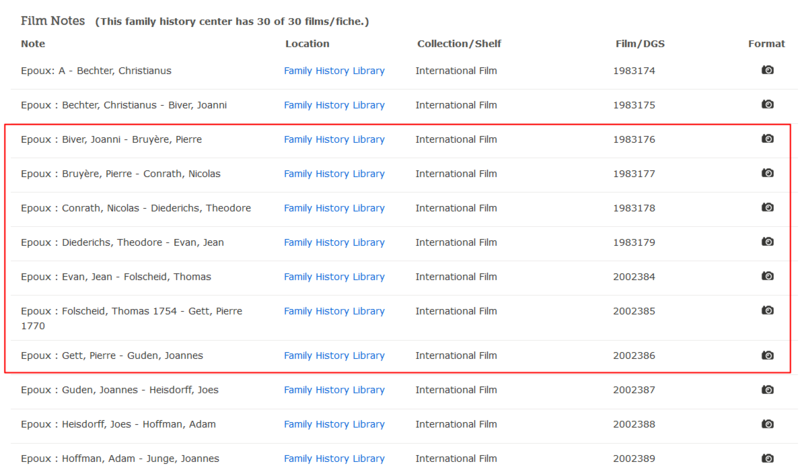 Not all records are indexed and not all browse only records may be showing up in a list as seen in my example above of the missing marriages for Luxembourg. Get into the habit of checking the FamilySearch catalog for the town, county, state, or country you are working on. 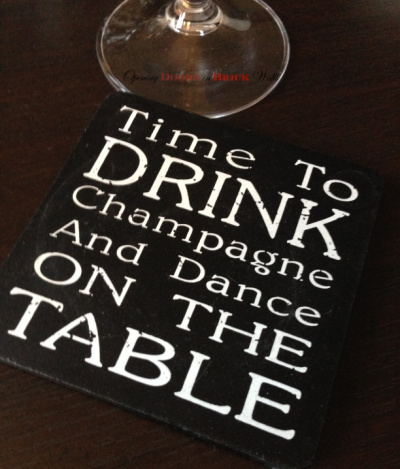 Happy Huntings!